The Moving Day Challenge Cup | Damian Trasler's Secret Blog - Do Not Read! Welcome to what I’m sure will be a thrilling day’s play, here at the Moving Day Challenge Cup. We have the home team of Dim and Mrs Dim facing off against a group of three young men from a removal company, described by an impartial observer as “Enthusiastic but unskilled”. Will that show in their game plan today, I wonder? Well, as you can see, the home team have made a good opening, with plenty of boxes pre-packed and neatly labelled, and they’ve kept separate a collection of cleaning equipment and coffee-makings. But the Movers also make a strong start, bringing out boxes faster than anyone would have expected…It looks like they’re going to get everything on the van before the home team have finished packing. No, wait, in a brilliant move, the home team have produced coffee and mentioned cigarettes. In a flash the game has turned around, as the Movers fall back to the van to sip their coffee and take a smoke break. That allows the home team to get more boxes packed and more furniture disassembled. There are some other players on the pitch here, and I can’t decide which team they’re on – they seem to be a collection of Tiny Weasels, and they’re scoring goals for both sides, disrupting the packing on one hand, and packing their own boxes on the other. It’s too close to call. And that’s half time! The Movers are taking the first load of possessions to the new house and the home team are splitting up to play on two fronts now. Mrs Dim and the Weasels are attacking the cleaning of the old house, while Dim attempts to organise the boxes and furniture as they come off the truck at the other end. Oh, and a foul has been perpetrated by the previous owners, leaving far more than they said “for temporary storage” in the basement of the new house, leading to awkward confusion as the new possessions begin to be dumped alongside the old. Now as well as directing the furniture to the correct rooms, Dim has to retrieve boxes from the basement and reposition them. This is definitely a case where the Movers are scoring an own goal, treating the labelling of the boxes as if it were some form of bizarre decoration, rather than indicating where the box should go. The whistle blows, and it’s Mrs Dim bringing over the Weasels and dog to play in the new house while she finishes the organisation, and Dim is back over to the old house to press on with the cleaning and oversee the loading of the last few pieces of furniture. He should also be bringing on the last player, the house inspector from the landlords….but wait! In a last-minute shocker, the house inspector is too busy to come out today! A reprieve for the home team, as now they have an extra morning to get the old house completely cleaned. 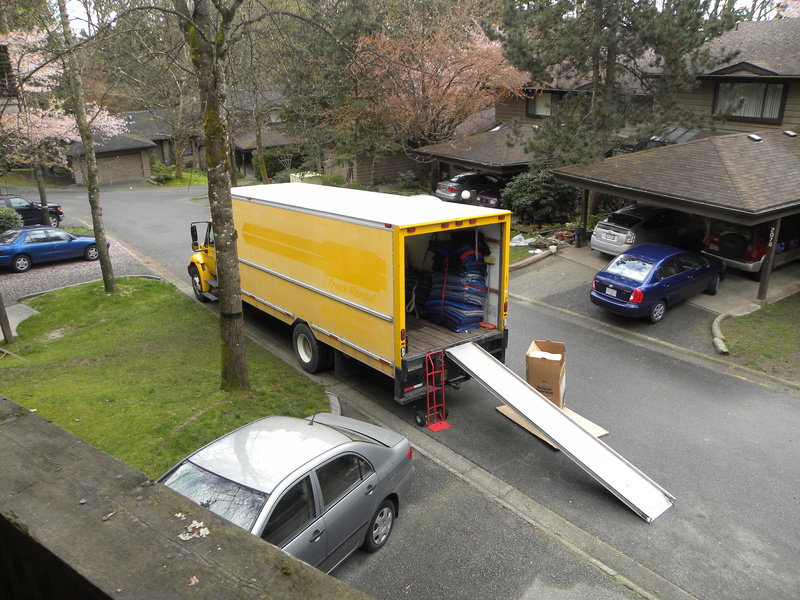 Dim is able to leave the old house as soon as the Movers have the last item on the truck and the action moves entirely to the new house for a thrilling finale. This entry was posted in Uncategorized and tagged boxes, challenge, Dim, dismemberment, fast food, House move, movers, Moving Day, Mrs Dim, new house, North Shore, Team Trasler, weasels. Bookmark the permalink. Your packers remind me of the team that did for us when we moved back to England from California. They were fine at packing. They even labelled everything, but the English language in general (and spelling in particular) was not their strong suit. An item of Sarah’s sports equipment came back labelled “hokey steak”. Moving house are the most stressful things in life. But with a little planning and our guide you can take the strain out of your move. Start your move at least a month ahead of time, so you have time to pack and take care of other tasks, such as selling your house or saying goodbye to friends and family members. Take an inventory of your possessions. Use this list to determine the number of boxes and the size of the truck you will need for your move. Think carefully about what you really need to take with you and what might be cheaper to replace or rent. Thank you, man and a van folks! It’s all good advice, but I think for most people it’s tricky to get it right. I know we only got good at moving house by doing it so often, and that’s not a method I’d recommend to anyone!